What is the single most important job of an outline for NaNoWriMo—or any other book at any other time of the year? We might come up with lots of answers, but they all tend to boil down to just this one: avoiding plot holes. I hate plot holes. They drive me bazooey. There you are, cruising along in a lovely story, full of lovely people, doing all kinds of fascinating things—when, bam!, you hit a massive plot hole. The story bounces three feet off the road, hits asphalt with a vertebrae-crunching thud, and half your lovely people (and their luggage) tumble right out the back of the story. Readers don’t much like plot holes either, but I think we writers have a special hatred for them, for the simple reason that we have to fix them. Unfortunately for us, filling plot holes is never quite as simple as strategically drizzling a little hot tar. However, on the positive side, if you make the time to approach your plot holes in a purposeful and knowledgeable way during your outline, filling them in doesn’t have to be tedious. It can actually be one of the most enjoyable parts of the entire writing process. The reason I became an outliner in the first place was because I kept running afoul of massive plot holes in my first drafts. Fixing them was a gargantuan task simply because it meant not only figuring out where the story had to go from there, but also returning to fix everything I’d written up to that point, in order to make it all fit. Plot holes are almost always the result of the story that’s already behind you—not the story that’s still ahead of you. This means dismantling and rebuilding everything you’ve already created up to that point. If you’re discovering these plot holes while in the midst of your first draft, you’re going to have to dismantle everything—plot, theme, character motivations, narrative, prose, and the Muse only knows what else. Ugh. But if you’re using your outline to spot the plot holes before they even happen, the most you’re going to have to dismantle is your idea of the story up to that point. You don’t have to rewrite a thing. You just have to cross out a few lines, turn the story in its new direction, and keep on trucking. It’s so easy. Nothing intimidating about it at all. More than that: it’s fun. Too often, discovering plot holes in the drafting stage feels like an exercise in self-flagellation: You messed up. You made a mistake. You weren’t a good enough writer to see this plot hole a mile off. Now you have to get down on your hands and knees and pay reparation. It’s not like that at all in the outline. 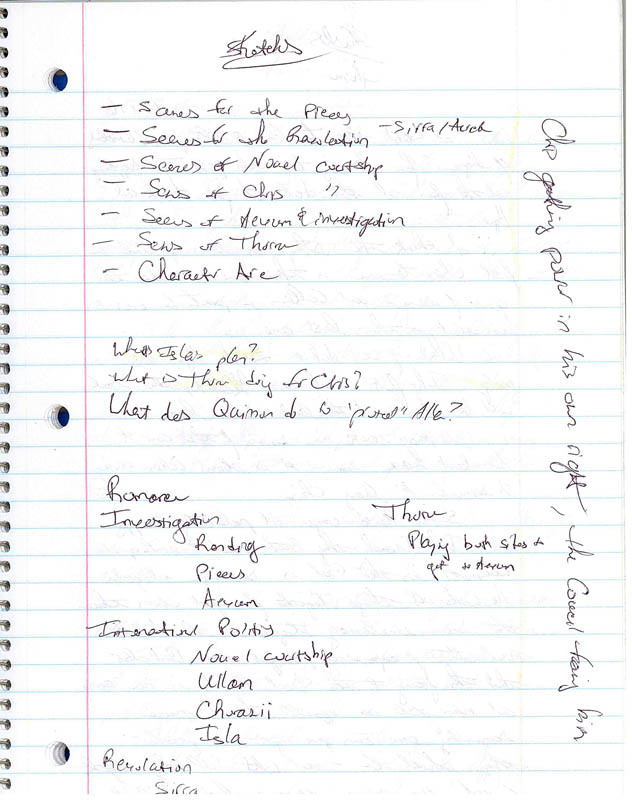 In the outline, discovering plot holes is exciting: Oh, look at this, a blank spot in the story you haven’t explored yet. What might you find? What’s this—a fork in the road? Which should you take? Why not both? Let’s sniff down first one trail, see what we find, and if we don’t like it, skip on back and try the other trail. If you make a wrong choice in the beginning, there’s no rewriting involved, and the amount of time “wasted” is likely to be measurable in minutes rather than days. As per the previous posts in this series, you should already have a good chunk of your outline—and thus your story—figured out by the time you’re ready to tackle your plot holes head on. 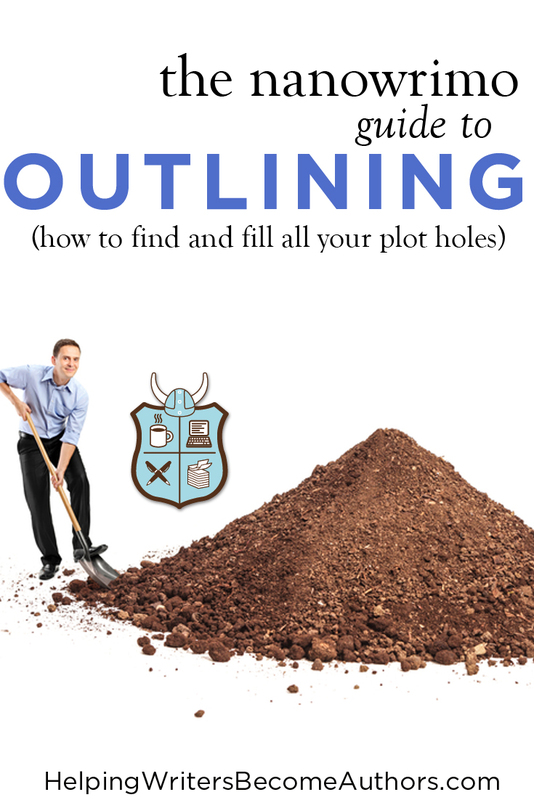 You’ve unearthed the skeleton of your story’s premise, plot, conflict, and character motivations. You’ve then breathed life into that skeleton by filling it with the beating heart of theme and character arc. In short, you know quite a bit about your story by now. In seeing what is there, you’re ready to begin identifying what isn’t—in short, your plot holes. Ask yourself the following three questions to suss out all the blank and/or weak spots in your story. 1. What Don’t You Know About This Story? Plot holes are nothing more or less than incomplete or incorrect causes and effects. Something happens within the plot that wasn’t set up properly or that defies logic. Inevitably, these result from blank spaces within the story—areas you didn’t fully explore in order to causally link one part of your story to another that follows. The first thing to do in hunting down these plot holes is simply to look into the darkness. Ask yourself: What don’t I know? What are you taking for granted about your characters, their motivations, and the consequences of their choices? 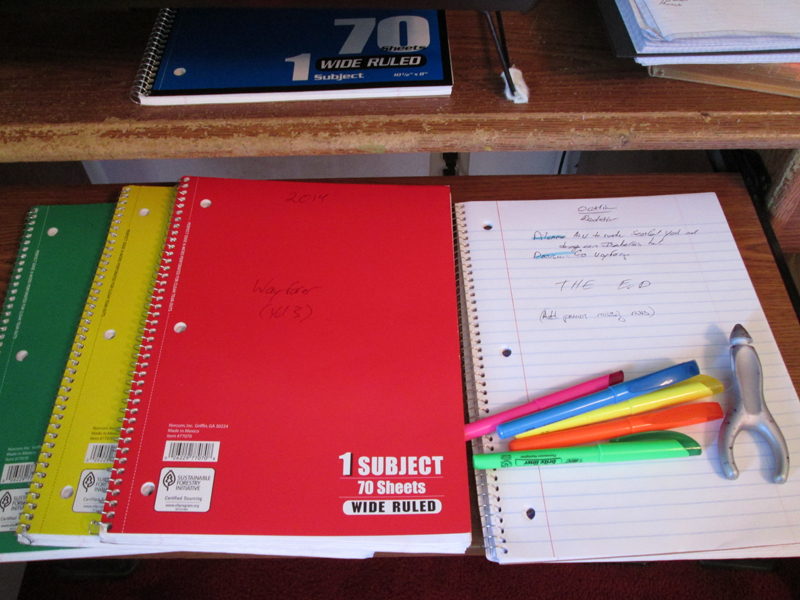 Sit down with your notebook and pen (if you’re outlining longhand, as I do) and consider what you don’t yet know about your story. My outlining setup. Plot holes are afraid of bright colors, don’t you know? Consider all the important actions you know your characters will be taking within the story so far. Whyare they doing these things? What are the story-specific causes that are creating these effects? The vast majority of plot holes arise from faulty character motivations: actions that have weak or nonexistent setup. Take a look at the scenes you already know will be happening in your story. Usually, these are “big” setpiece scenes, perhaps even scenes you’ve been dreaming about since the very moment you came up with the story idea. But what happens in between these big scenes? What’s the filler that links them? Each scene must lead naturally into the next, which means there must be a causal chain to keep them from feeling like random episodes within the plot. What specific scenes and events are occurring to advance your characters’ relationships? This is especially important to consider with romantic relationships, but also just generally with any relationship that will evolve over the course of your story. If the characters start at Point A and end at Point B, they must experience obvious “marker scenes” along the way that create the progression in the relationship. Your feisty romantic couple can’t logically go from hating each other at the meet-cute to being true lovers at the end, unless you’ve filled in the blanks in between. 2. What Are the Specific Questions That Need to Find Answers? When you get stuck—and you will get stuck—remember to ask yourself questions. Instead of stating the problem—“the princess is trapped in the high tower”—phrase it as a question—“how can I get the princess out of the high tower?” It’s amazing how much creativity can be unleashed with a question mark. For a squiggly line with a dot at the end, it wields untold power. Periods put a full stop on inspiration. They indicate whatever idea the preceding sentence holds is complete unto itself and doesn’t require further exploration. A question mark, on the other hand, is a swinging door, urging us to step forward and peek through the opening. What’s in there? How can we find it? How can we use it? The General Sketches section of the outline is all about asking questions, finding their answers, then looking again to discover what new questions have arisen. When you run out of questions (which will continue through the next couple of outlining steps, which we’ll be discussing in future posts), that’s when you know you’ve finished your outline. The more explicit your questions, the more explicit and helpful your answers can be. These questions will arise out of your discovery of the “blank spaces” in the previous section. They will be specific to your particular story and its needs. What plan is Isla (a minor antagonist) concocting? What is Thorne (a potentially shady sidekick) doing for Chris (the protagonist)? What does Quinnon (a bodyguard) do to “protect” Allara (the co-protagonist) that gets them both in trouble? How does Chris gain enough power to threaten the Council? How is [Spoiler] playing both sides? If I left any one of these questions unanswered, I would end up with tremendous plot holes. Every single event in the story will affect every single event to follow, which means if I leave them blank in my own mind early on, I will likely end up failing to properly set them up subsequently. 3. What Are the Subplots? 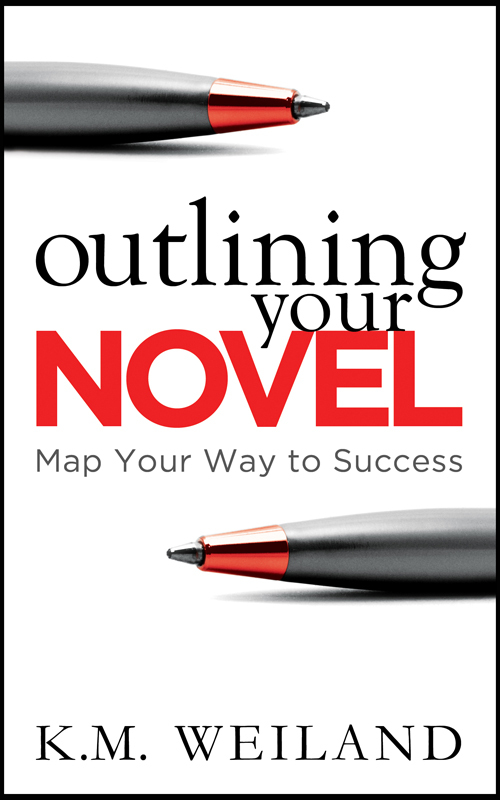 I’m often asked: “How can I outline subplots?” Ultimately, you outline subplots just as you do any other aspect of the story: by being aware of them. This filling-in-the-blanks segment of your outlining process is the perfect place to dig up those important subplots and look at them in the full light of day. Protagonist’s relationships with minor characters. Minor characters relationships with each other. One of the best places to look for plot holes is in your subplots. Depending on the scope of your story and its stakes, your list may not be this long (or it may be longer!). You may also choose to eliminate or minimize some of the subplots in order to streamline your main plot. But in creating a list of all your options, you can figure out which are crucial and what further discoveries you need to make sure they fit into your story with believable cause and effect. Now that you’ve identified all these potential plot holes—all these questions—now what? Now is where the fun begins. You get to start brainstorming answers, throwing ideas at the wall, and seeing what sticks. Ask lots of what if? questions. What if the hero had an evil twin? What if the heroine adopted her sister’s baby? What if the bad guy insinuated himself into the hero’s inner circle? What if, what if, what if? The possibilities are gloriously endless. When you’ve come up with an idea you like, stop and highlight it in your chosen color (blue is mine). When you find that in answering one question, you’ve raised a new question (or three), highlight them in a different color (green, for me). This way, you can return to your notes, save the “Keeper” ones and create a new list of Questions, using your green highlights. 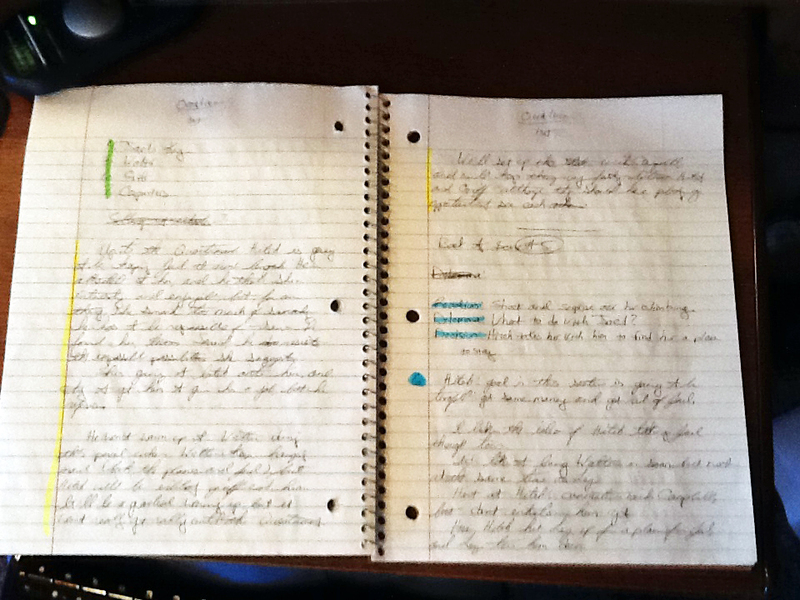 I use blue highlights to indicate “Keeper” ideas and green highlights to indicate new Questions that have arisen. This is, bar none, my favorite part of the outline. It’s like watching the sun rise over the horizon. What was once a vague and murky landscape suddenly becomes a clearly defined vista. All the pieces start materializing. The story is there. You’re not even so much writing it as watching it complete itself. It’s magic! And the best part is that, when you’re done, you will have a rock-solid story, tested and re-tested by logical questions to make sure you can safely drive your first draft straight on through with hardly a bump. Stay Tuned: Next week, we’re going to talk about how to outline your characters’ backstory to create amazing subtext for your plot.